Vinson Boys: Can I ride? Lately, Tate has been trying his darndest(is that a word...only in TN) to keep up with his big brothers. 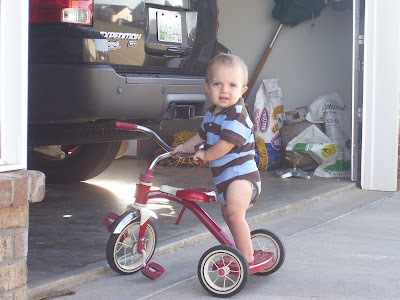 Most afternoons are spent outside pushing, riding, pulling or moving some kind of object up and down the driveway. THis was a glimpse of a Sunday afternoon before our little chilly-snap. I'm not saying cold, because it really was just chilly! My little boy is growing up so much, I just can't believe how much faster each consecutive child's first years are. Does that make any sense? Oh well, I hope I'm clear! All that to say, I just love our little Tater Bud! Great shot of Tate. He's joining the ranks, isn't it. I know what you mean about the growth of the younger ones. It happens so quickly.